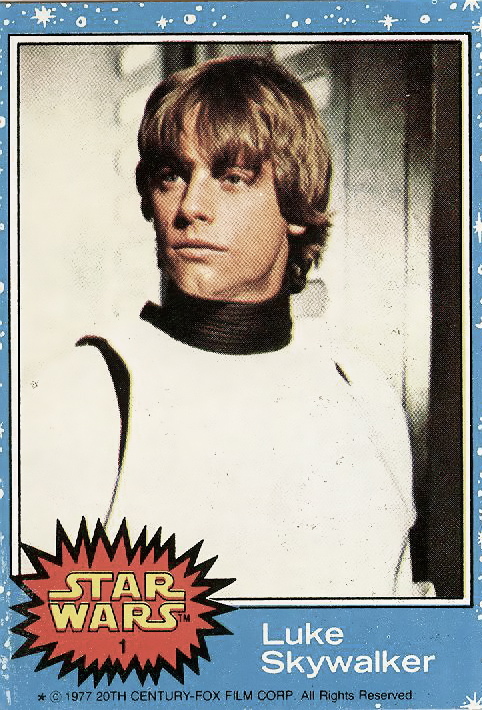 STAR WARS CARD NUMBER ONE of the staring point BLUE SERIES, shows Mark Hamill as LUKE SKYWALKER, which is what the caption reads, wearing the Stormtrooper outfit when he, Han and Chewie went in disguise to first: escape from the docked Millennium Falcon and then to rescue Princess Leia. This almost looks like the moment when Luke, while the trio and the droids were inside the power chamber room, could entice the selfish smuggler into pulling off this daring deed for large sums of money… more than Han could imagine: and Han can imagine quite a lot. The card is truly retro, including the red explosion around the word STAR WARS, the light blue around the border making up for the multiple colored series, the yellow lettering and white stars around the dotted around the border. The back of the card is but a single piece of a jigsaw puzzle that makes up an image when all are put together.